Throughout her life, Amber West has filled her time with organizations such as 4-H and the Tampa Bay Children’s Chorus. Looking back, she can see she wasn’t only learning about dog shows or proper singing techniques — she was developing skills in leadership and communication that continue to serve her well. A servant-leader at heart, West continues to volunteer with those same organizations, hoping to impart some of those same learning opportunities that were so meaningful to her. She is a member of the Hillsborough County 4-H Dog Project Committee and helps plan events, judge dog shows, and lead training seminars. Working with the Tampa Bay Children’s Chorus, she used her business acumen to organize nearly three decades’ worth of sheet music into a searchable database. She has also been a worship team leader at Southside Baptist Church for the past three years. In addition to service, she also prioritizes her professional and personal development. As a member of Beta Alpha Psi, she has expanded her professional network and holds a leadership position as the chair for the 2021 banquet, which honors students who have earned an A or B in principles of financial accounting. To complete her honors thesis, she chose a nontraditional research project, which will result in the inaugural Women in Accounting Symposium at the Lynn Pippenger School of Accountancy. Smart, talented and dedicated young lady! Very bright, unselfish, friendly, and worthy honoree! Congratulations! 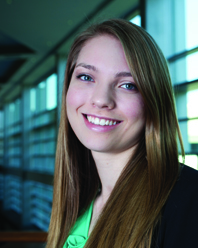 Amber excels in all four areas: scholarship, leadership, career development, and service! She is definitely worthy of this honor!